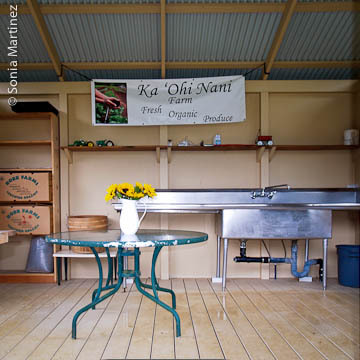 “Ka ‘Ohi Nani” means The Beautiful Harvest, and Ka ‘Ohi Nani Farm in Waimea is very aptly named. Tucked into one of the many little lanes near Pu’u Kapu, and just off the main road on the Hamakua side of Waimea, the farm is as beautiful as the name implies. Owners Steve and Lark Willey are as dedicated to beauty as they are to the fruit of their labors. The first sign of beauty in the garden is a six year old rose vine covered arbor entryway that serves as the portal to the official ‘garden,’ fields, and farm buildings. After parking we walked to the recently finished processing shed. Outfitted with a center table, shelving, counters, and sinks with running water, this is where all the produce is first brought to be cleaned and packed for distribution. Across from the shed is Lark’s ‘playground’; the garden where she likes to experiment with new crops and to grow masses of herbs, edible flowers and other goodies that she likes to tuck into the CSA food boxes as a little extra. Just beyond the processing shed is the chicken house, home to several beautiful and plump looking hens that provide eggs for Lark and Steve’s use, and also to include in the CSA boxes. Production field at Ka 'Ohi Nani Farm. There are two fields where they grow all their vegetables and a third field where Steve grows several varieties of taro. The size of the area in cultivation is only one acre, but looks much larger due to the quantity and diversity of vegetables. Rows are rotated and some left fallow for a growing cycle or two while Steve and Lark feed and enrich them for the next growing cycle. The Willeys have been farming and in the landscaping business for 22 years, first in Maui and the last six years on Ka ‘Ohi Nani Farm. Their CSA has been in operation for only two years, but already has a waiting list for future subscriptions with advertising provided only through word of mouth by their subscribers. Although their 2,900 foot elevation farm is not certified organic, they follow organic practices and don’t use any chemical fertilizers or sprays; as they say, ‘our family eats it also’. The land is turned with a rototiller and weeds are pulled by hand; additions of organic Bio Flora, Gro Ganic, EZ-Green and Rock Phosphate are periodically added to enrich the soil. The location is ideal for year around growing not only in the raised beds and fields but also in the greenhouse. Processing shed at Ka 'Ohi Nani. 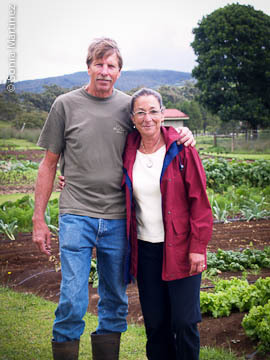 “As a Kama’aina family from Maui, we have always been avid organic gardeners”. Lark explains. “As our kitchen garden grew each year, Down To Earth approached us with their ideas and became our first commercial account. In the years to come we were providing both stores on Maui and Oahu with our certified organic produce. “We have selected Waimea for our home and farm location because of the fertile soil, growing conditions, and a wonderfully diverse agricultural community. 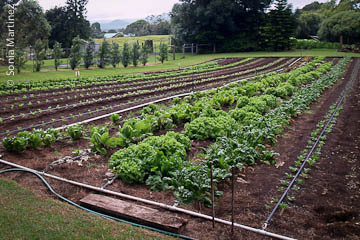 We feel that Hawai‘i Island has such an amazingly supportive awareness for sustainability and farming. We feel blessed to be part of this journey. There’s a minimum two month commitment from each subscriber for the weekly CSA delivery program, and if a subscriber has a vacation or unexpected absence, at least a one-week notice is required for a temporary stop of deliveries. All CSA orders are harvested and processed on Thursday mornings and delivered to their subscribers’ destinations in Waimea, Anekona, Kanehoa and Kamuela View Estates that same afternoon, ensuring that everything is delivered as fresh as possible. CSA box packed for distribution. 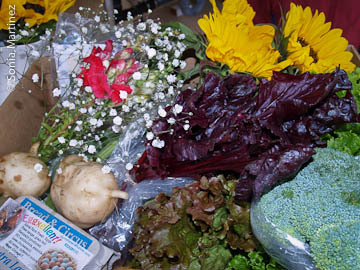 The variety of the contents in the CSA boxes can be any mixture of lettuces, spinach, kale, Rainbow chard, leeks, fennel, beets, beans, sugar snap peas, broccoli, a variety of squash and pumpkins, taro, corn, tomatoes, Chinese cabbage, collards, parsnips, carrots, bell peppers, boc choy, tatsoi, turnips, Lark’s sassy mix (arugula, mizuna and baby choy) and sometimes specialties such as yacón, taro, Steve’s kulolo, eggs, and mushrooms. The week of our visit, the boxes contained Ruby red grapefruits, a bag of spinach, green and red leaf lettuces, a head of broccoli, beets, sweet and crisp carrots and a carton of eggs. A note with the contents of each box is always enclosed as well as sheets with recipes using the week’s ingredients, and Lark’s weekly newsletter. Seasonal items sometimes included are artisanal breads and pumpkin muffins. Name dropping at its best as a bonus: if a new subscriber mentions the name of an existing subscriber, the old subscriber receives $5 off their next box. All memberships are at the same level and priced at $20 weekly and each box will contain from 7 to 8 different products; vegetables, fruit, eggs, always free radishes, bunches of herbs and complimentary flower bouquets, plus other goodies from time to time. Steve and Lark continue to expand their growing fields and selection of products to accommodate a growing demand. They are also working on ideas for unusual services to be provided, hopefully in the near future. Subscription $20/week, minimum 2 month commitment.